This is a guest contribution from My business partner Adam Franklin attended the ProBlogger Event on the Gold Coast in 2014, and returned fired up and with a whole heap of take-homes. At the ProBlogger Event, Darren spoke of success being a matter of doing the ordinary things. Specifically, to start, put readers first, be useful, find your rhythm, create meaning, and persist! This has inspired me to share this recent guest blogging story. We’re not talking about guest blogging that Google frowns upon, but high-value blogging via influencer outreach. Guest blogging is a hot topic we’ve been asked a ton of questions about lately and with good reason. If creating great content is the first step, then promoting your content is the crucial second step. Guest blogging is a powerful way to do just that as you get to write for a whole new audience! As well as helping you dodge some of the key mistakes, planning your guest blogging strategy will help you find, evaluate and target the best blogging opportunities. This post helped us hit a record month in website traffic. 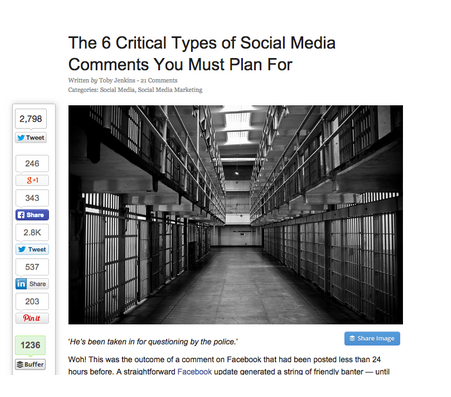 I had a call to action in the article and linked to our Negative Comments Response Template (for Social Media) landing page. 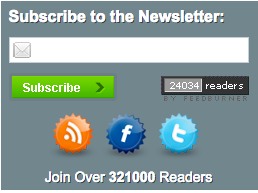 Visits to this page skyrocketed and so too did email opt-ins. 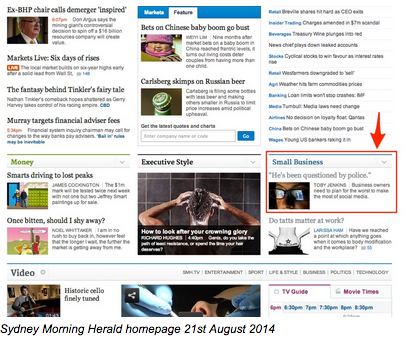 It caught the attention of Fairfax Media. Finally, when we sent this post to our Bluewire News subscribers, a journalist replied and asked if I was interested in writing an op-ed piece for Fairfax Media (one of the largest media companies in Australia). Of course I agreed! For the SEO geeks, these 50 backlinks were from news websites with domain authorities ranging from DA38 to DA92 and I was fortunate to have a follow backlink in my bio. Building backlinks, watching traffic spike and getting qualified subscribers are all exciting outcomes. I was genuinely surprised (and stoked of course!) that this article had struck a chord. You can see why guest blogging can be a powerful tool. 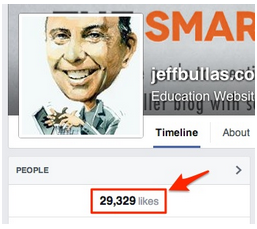 Why did we approach Jeff Bullas? Aside from being a Forbes Social Media Power Influencer, there were a number of strategic reasons why we asked Jeff. In short, he has a hugely popular social media marketing blog, followers in excess of 250,000 and we had built a strong relationship with him over the years. We also knew he accepted high quality guest posts. I’d aspired to write for Jeff’s blog for a long time so I’ll use it as an example as we go. For the rest of this post I’m going to take you step by step through the Guest Blogging Strategy Template. (If you’re really keen you might like to download our free Guest Blogging Strategy Template and fill it out as you work your way through this post – if not, then just read on!). This doesn’t need to be a long, drawn out process. Take 15 minutes to brainstorm and list some of the blogs you’d like to write for. An easy way is to simply google blogs in your niche; for example “social media blogs” or “gardening blogs”. Large or small, seemingly impossible or really easy, just get them down. Sometimes this can feel like you have waaay too many options. That’s ok – the next steps will help you prioritise your target blogs. 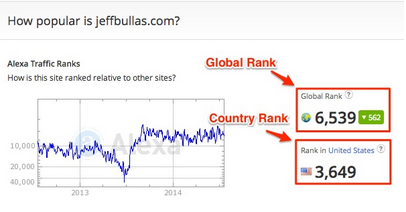 Jeffbullas.com has a Domain Authority of 71/100 which is really strong. 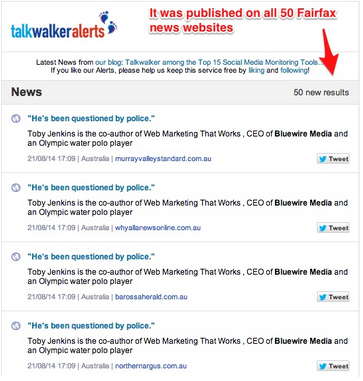 To put this in context, Google.com is 100/100, Forbes.com is 97/100, and Bluewiremedia.com.au is currently 46/100. 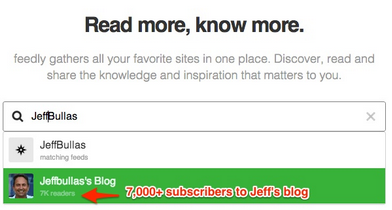 From an SEO standpoint alone, a backlink from Jeff’s website would be really valuable to us. Jeff’s website gets a ton of traffic which means that the article would be seen by lots of relevant people. Email lists are a great indicator that the time you spend writing your content will be rewarded when it is seen by a large relevant audience. Twitter followers are easy to find for Jeff. He has 246,000! As you can see getting these numbers isn’t a long process. In fact it could be a piece of research that you ask an assistant to help you with. As a part of your research, find out the contact person for each blog and their email address. Jeff has built an incredible audience, following and reputation. We’ve deliberately got to know him over the last few years by interviewing him in person and on our podcast, following his work on social media and inviting him to speak at our Social Media Down Under conference. Because we’ve known him for a long time and nurtured a relationship, Jeff was much more likely to trust our content and therefore to post it and share it with his audience. He accepted it, tweaked the title and posted it the next day. The point worth emphasising here is that Jeff is a high-value, power blogger so without our long ‘getting to know you’ process our chances of acceptance would’ve been much slimmer. You’ll see it took years of proactively getting to know Jeff and this email was the final stage of following a deliberate process. I’ve outlined all the steps in our Blogger Outreach Email Template. If you do get knocked back, don’t let it get you down, just read How to Handle Guest Post Rejection and get back on the horse. You can tweak the post and try again or submit it to a new blog. > How interesting is your content going to be to their audience? Once you’ve determined that it’s definitely an audience you’d like to reach, then it’s crucial that you tailor your content for them. I thought my article on handling social media comments had a very good chance of being interesting to Jeff’s audience. Please note: Ultimately making your content interesting to their audience is the single biggest factor in the success of your guest blogging. Understanding the different angles of your story that will enable you to tell it to different audiences is a deal maker and breaker. There are lots of ways you can craft your experiences and stories to fit different audiences. How To Use Your Financial Reviews To Improve Your Marketing. And another one I wrote for outsourcing giant oDesk discussed managing remote marketing projects: 10 Minutes Can Transform Your Remote Projects. In order to make sure the post would be interesting to Jeff’s audience, I also reviewed what other articles had been written on comment handling on his blog to make sure it would add to their points and not just rehash them. I found an earlier post and linked to it in my article to demonstrate that I had done my homework. I also reviewed other guest blog posts to make sure my article would match the style. From an SEO standpoint, I made sure I had my bio linking back to our website, specifically where people can download our 33 free marketing templates and I had a call to action to download the Negative Comments Response Template. 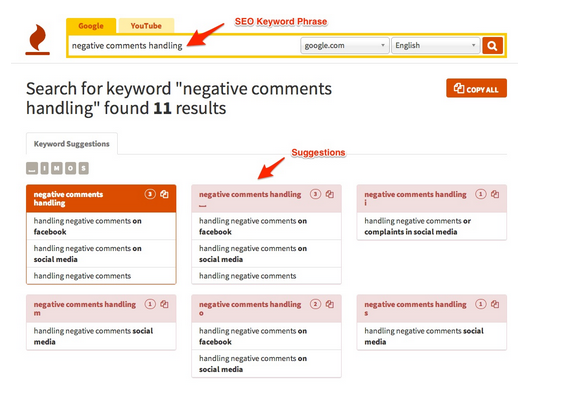 I’d decided to target the keyword phrase ‘negative comments handling’ using the free Keyword Tool. Then it’s a matter of getting in, writing the article, hitting your deadlines and making sure you give yourself the best chance of success. Hopefully this Guest Blogging Strategy Template can help you focus on the opportunities that will get you the best results, fastest. The little bit of research upfront will really prepare and help you to make the most of the effort you put into the guest blog post itself. What else do you look for when assessing guest blog opportunities? I’ll see you in the comments and the most informative commenter wins a copy of my book! 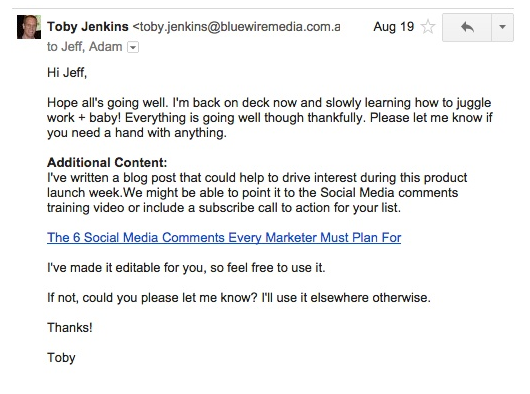 Toby Jenkins is an Olympic Water Polo player and co-author of Web Marketing That Works. 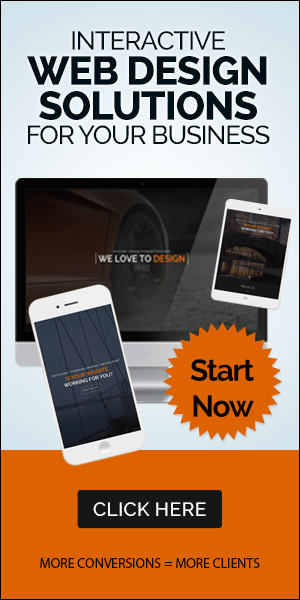 You can download his 33 free marketing templates.